What is blue and white and orange all over? and no the answer is not the Auburn University football team…Roll Tide! It’s my new dining room! 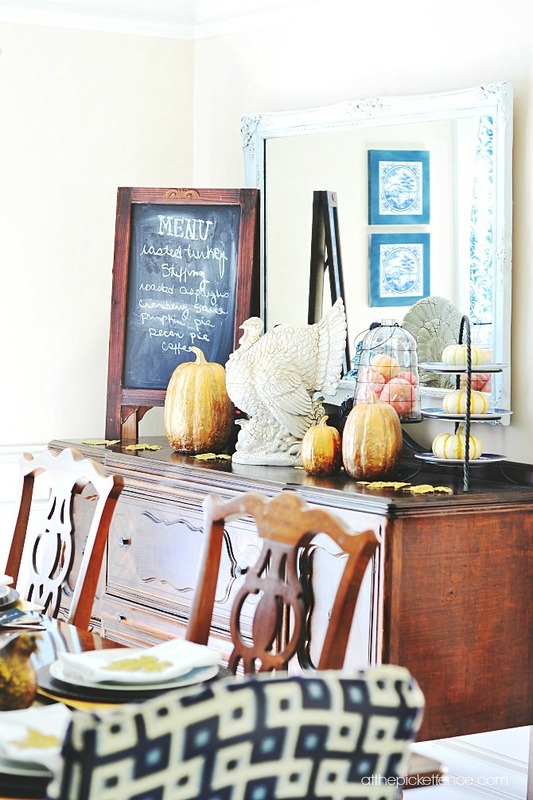 I’m so excited to share my dining room reveal with you, all made over for FALL! I was privlidged to team up with Kirkland’s (and four other amazing bloggers) for a challenge to dress up a room for the autumn season. My dining room seemed like the perfect choice! You might remember when I shared the before pictures of our new house and told you how much I loved this space. 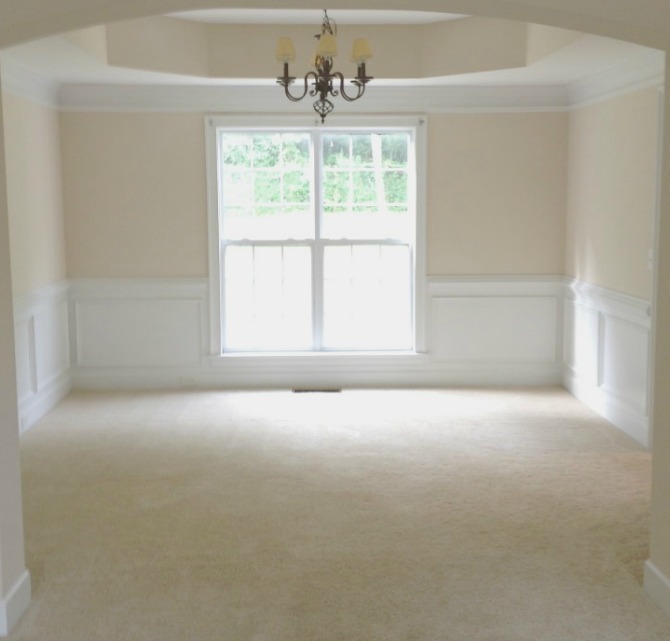 With beautiful wainscoting, crown molding and high ceilings, it was perfection! I’m so excited about how it turned out! I love the blue and white paired with the dark wood. Even more fun was getting to accessorize it for my favorite season! 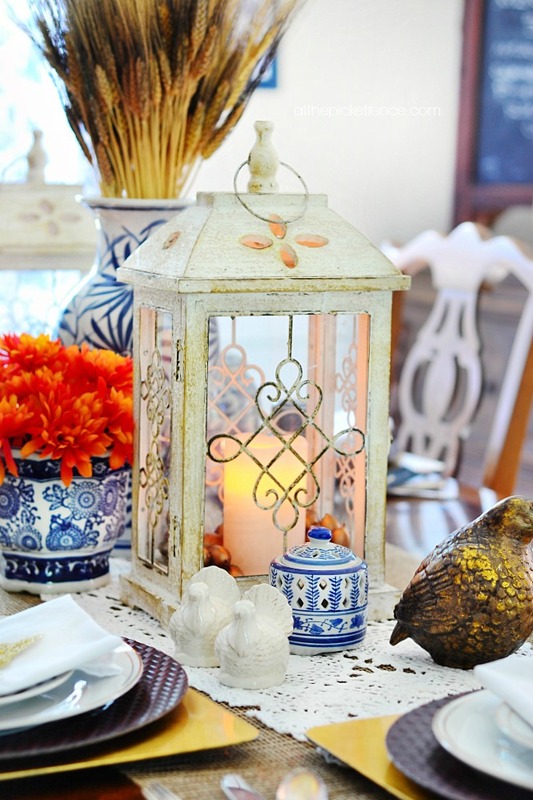 There are so many ways to add autumn to the dining room. Chippy white washed lanterns are a fun option for adding lighting to a fall table and I couldn’t pass up these darling white turkey salt and pepper shakers for some whimsy. Blue and white pairs so pretty with orange mums. Run a length of burlap down the center of your table and top with a pretty vintage crocheted runner for a rustic refined look. 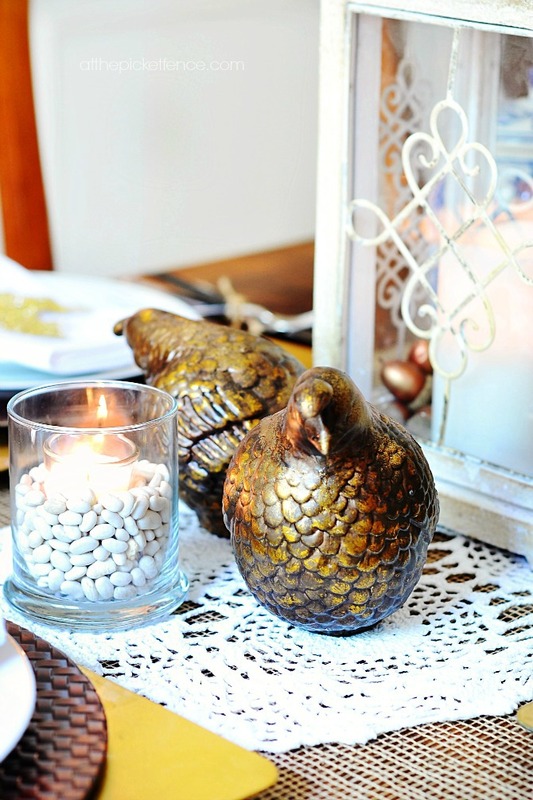 This sweet little pair of gold burnished pheasants are sitting pretty on the table. For additional ambiance you can fill small glass containers with beans and nestle in votive candles. I’m all about the little details when it comes to setting a holiday table. I used these darling bronze acorns to fill the bottom of the lanterns. 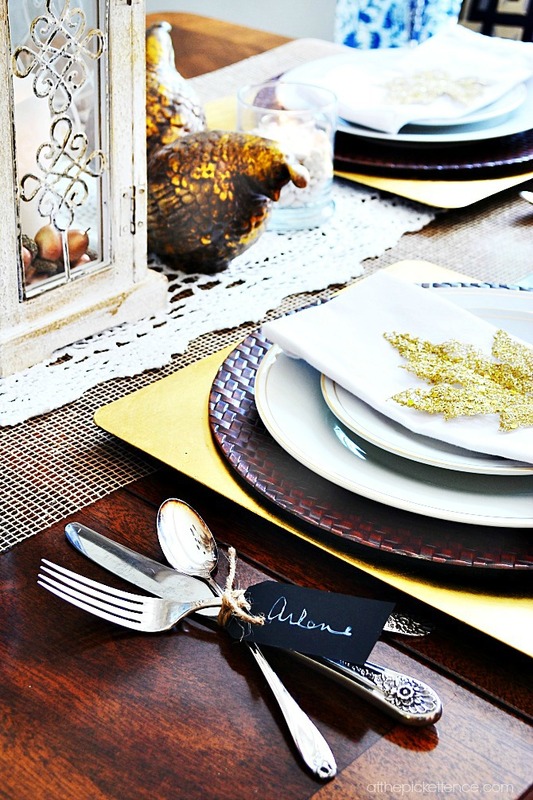 You can let each guest know how special they are by tying up vintage silverware place settings with tiny chalkboard tags! Spell out seasonal words on white platters, like these Sweet Olive Platters from Kirkland’s, and hang for a simple display. They can be changed for each holiday or special event. I’ll be showing you how easy these are to make in an upcoming post. Decorating the sideboard can be as fun as decorating the tabletop! Tom Turkey will stand proud watching over the desserts this Thanksgiving! Let your guests know what you are serving by sharing your menu on a chalkboard easel. When not using it for a menu board, you can display a favorite seasonal quote. 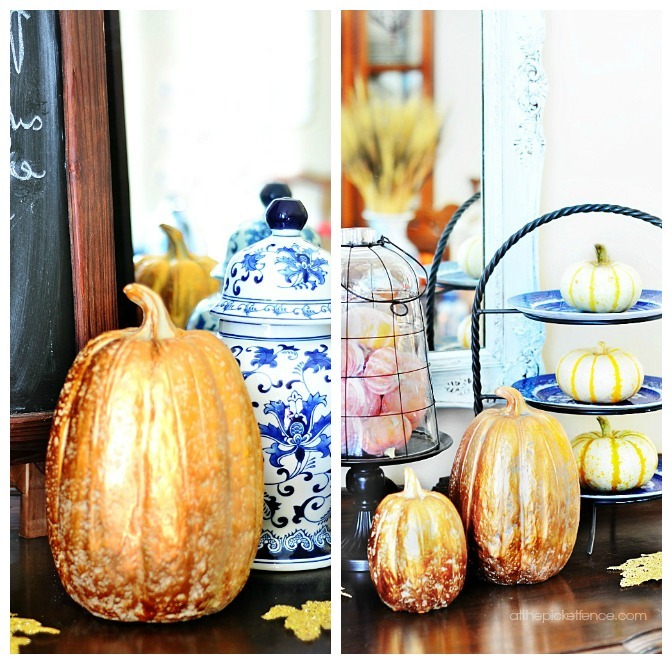 This trio of gold pumpkins gives a little bling to the sideboard when paired with my blue and white ginger jar and thrift store find willow ware plates. There are so many ways to make your your house a harvest home and Kirkland’s is the perfect place to turn to for beautiful holiday decor! If you’d like to see the rest of my house decorated for fall, you can visit our Finding Falls Home Tours! I’m teaming up with four other amazing bloggers for Kirkland’s My Harvest Home! Be sure to see how they are showing off fall at their houses. KariAnne of Thistlewood Farms, Laura of Finding Home, Kim of Sand and Sisal and Jessica of Four Generations One Roof. 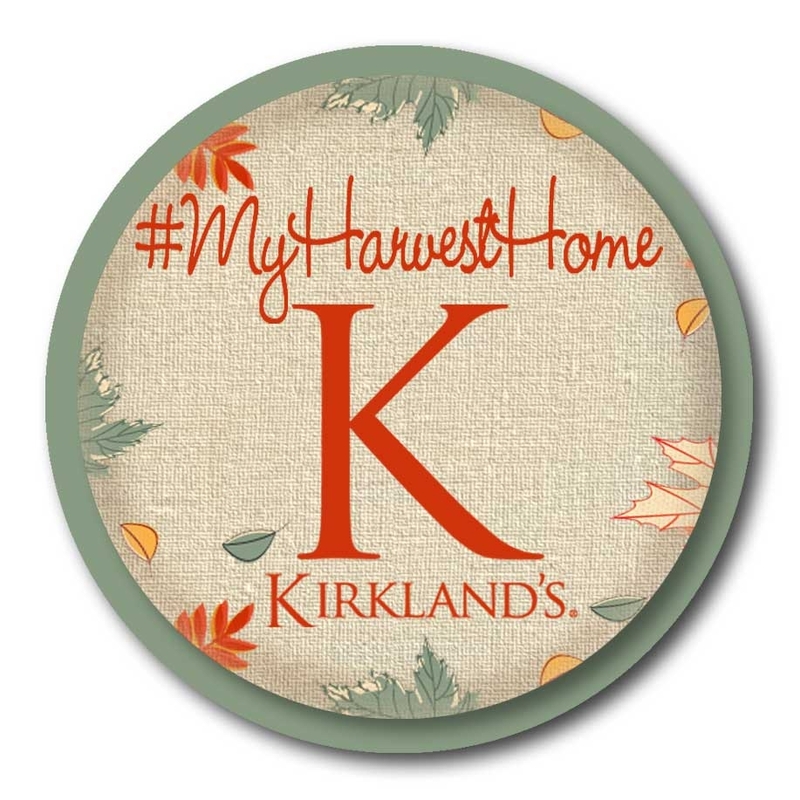 AND we’re excited to be offering FIVE, yes count them, FIVE $75 gift cards to Kirkland’s so you too can add some fun harvest touches to your home! I received compensation for the “My Harvest Home” campaign blog post. Kirkland’s partnered with several bloggers like me to raise brand awareness. All purchases and content are on my own accord and reflect my personal opinion and style. Kirkland’s blogger outreach policies abide by the WOMMA Ethics Code, FTC guidelines and social media engagement recommendations. For official Kirkland’s giveaway rules, visit Kirklands. 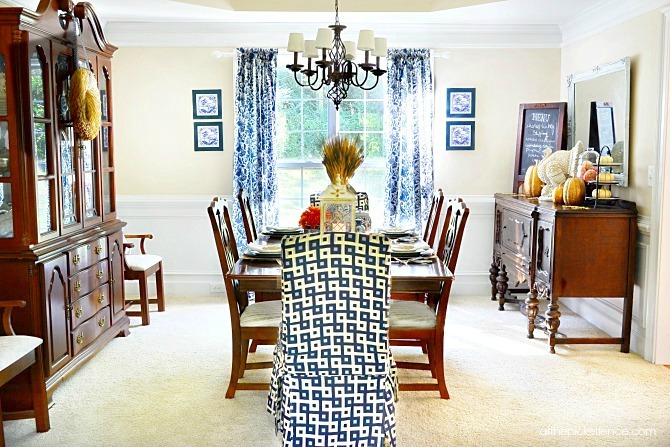 71 Comments on "Blue and White Fall Dining Room Reveal ~Kirkland’s Giveaway"
love the deer heads in the fall cabin collection!! I hope I’m the lucky winner! Ohhhh, the blue velvet settee is gorgeous! Nice options. Thanks! It’s stunning! Beautiful and cheery and full of family love. Great job, Heather! Great job Heather. I love it!! My favorite from Kirklands is the Birch Pillar candle holders. Love the damask slipper chair. Jewelled Peacock Plaque…love it & have it on my wishlist! I love the fruit and pine cone wreath. It would be a beautiful accent to my front door. Oh Heather. I could sit in this room all day and be perfectly happy. It’s stunning. I have traditional, dark furniture too and struggle all the time trying to lighten things up. You did it so well! The comforter set would be perfect for my bedroom. Love your blue and orange dining room. I visited the Kirklands site and did you see the glass gourd and crackle glass pumpkin? I love those too! Love, love, love, (insert 5,000 more loves here)! You are SUCH a rock star!!!!!!!!!!!!!!! I adore everything! It’s been so much fun hanging out with you friend! Love everything about this room! Gorg! Love the Black Bear Statue in Kirkland’s Cabin and Lodge collection. So I just have to pick one…. 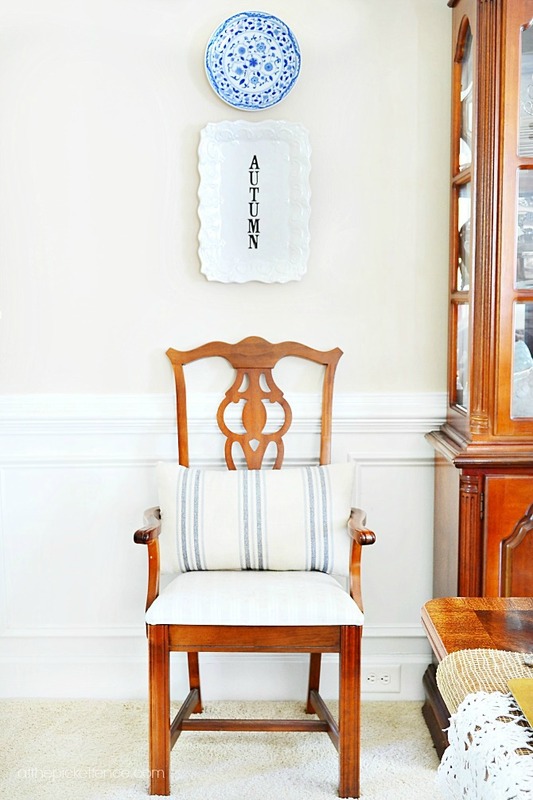 I luv their slipper chairs.The Birch candle holders… I am doing a softer side of Fall this year and luv those. Plus the dreamy white dishes… swoon!!! Luv your dining room!!! 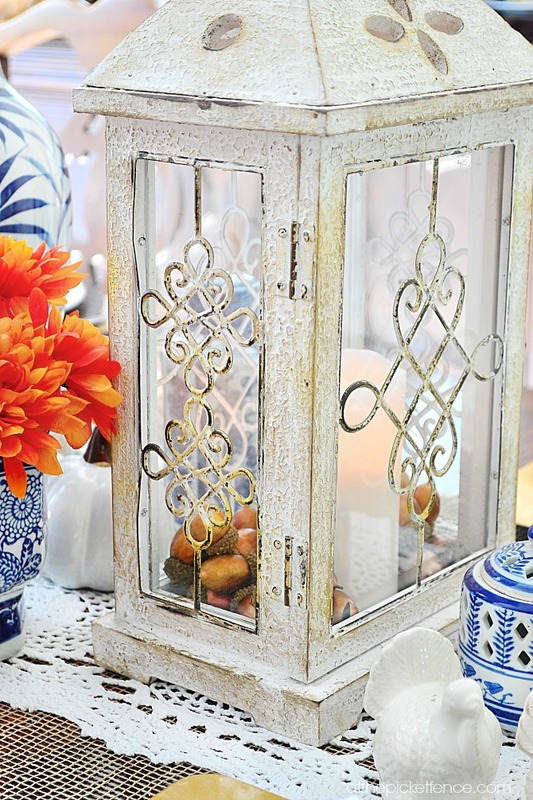 Lantern envy! I really like their Melody Mocha Chair. Kirkland’s is a great place to find anything you need for your home! Love this store! 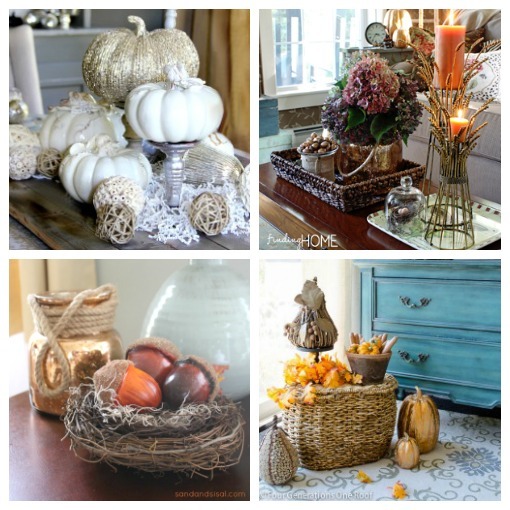 I love all the fall decore! Cobblestone Candles, look fantastic!Love Blue and White Year Round, with a dash of silver. You enjoy that beautiful space! Loving the burlap Jackolantern! I also can’t wait for the post about the platters! I love the Futura Wall Mirror and the Wheat Bushel Candle Holders. So Inspiring! thank you! 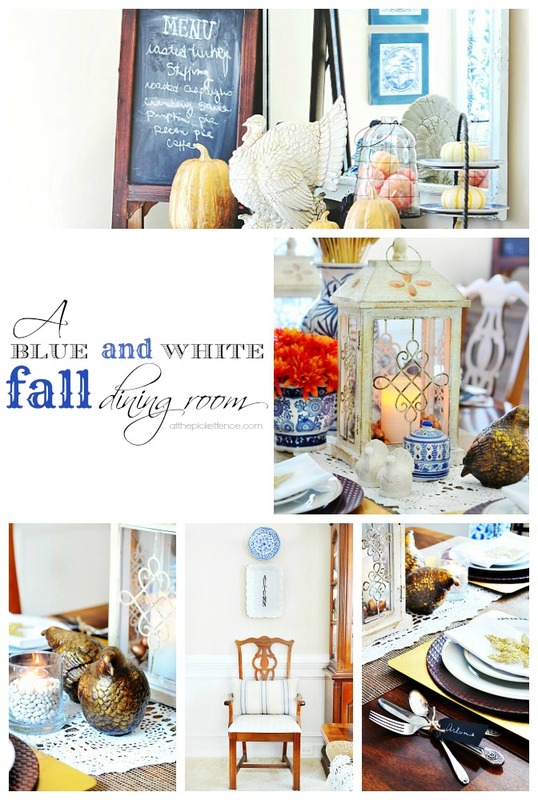 I have many blue and white collectibles, never thought of using them for Fall, but now I will! 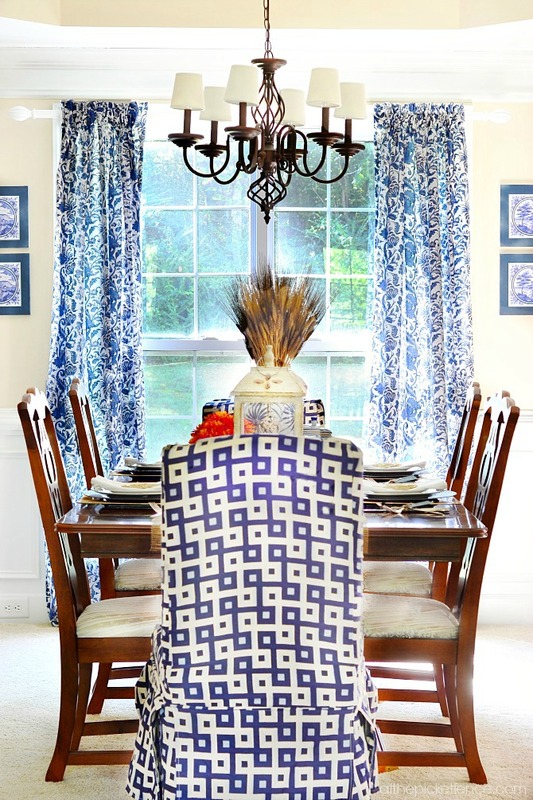 Oh I love love love the blue and white in your dining room! And I am so happy to see the blue. Planning to paint ours in a gray blue and cream. After seeing how pretty the blue looks I am really excited to tackle our space. Super job and perfect for the autumn! Heather, your dining room is absolutely stunning…enjoy the season with it’s beauty! Your dining room is gorgeous, Heather! 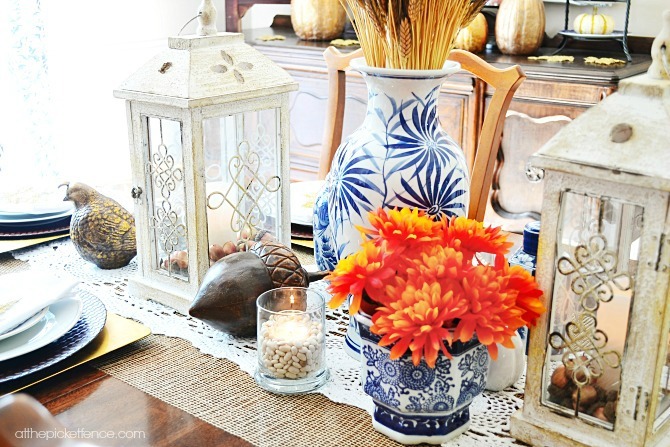 I love the blue and white palette with the pops of orange! Fabulous new curtains, too! I love the Nora Queen Headboard! What an awesome giveaway! I just love your decor. Browsing around at Kirkland’s I found this gorgeous Marquette Canvas Art Print that I LOVE! Blue and white-hooray!!! My favorite of all time. I’ve never seen anyone do it up right for fall and I looooove it! Actually, who am I kidding, I like a lot of things!! 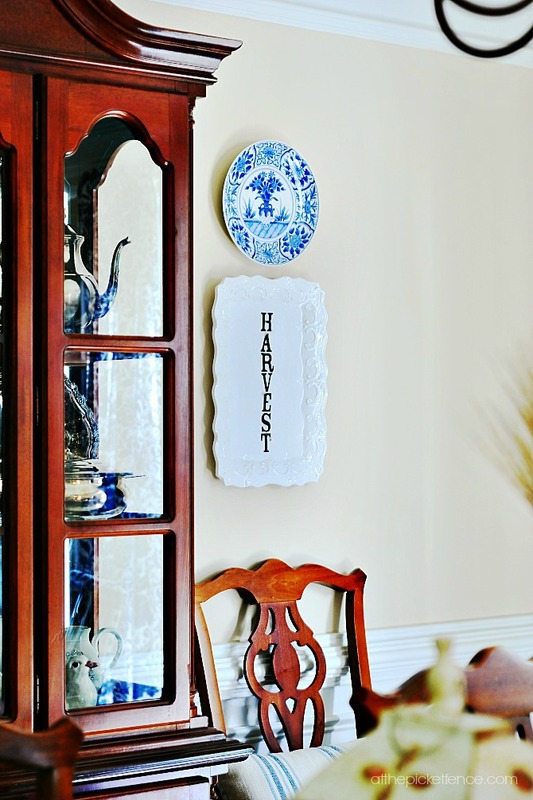 Loved your ideas for the blue and white dining room…mine is also blue & white. I especially liked how it was elegant and subdued. love love love!!! This dining room is modern traditional!!! You really added some great style with the beautiful blue fabrics along with the architectural elements! And pairing it up with orange is perfection. What a great striking combo. You have made all this beauty even more special by adding all the fabulous detail to your table (sigh) and sideboard! I’m copying your olive platter idea! Thanks, Heather and Kirkland! I was just at Kirkland… WHO KNEW! Great stuff! LOVE the lodge look. That 3 tiered kitchen cart would look great as a bar in my dining room!!!! Just might have to get it! I am loving the peacock art prints!! There are way too many products that are my favorite! It would just be wrong to choose only one! I love those little pheasants and all the hits of dark blue!! Elegant and chic! Pinned!